Shoe-shopping for wedding functions is never fun for us. Why, you ask? Well, because we’re so clumsy with heels that it borders on menace. So, when we found Poshampa’s sparkly, funky sneakers, we decided to stock up a few pairs so would replace our beaten-down flats with these beauties that keep our heels and sanity safe. Whether you’re a bride-to-be that doesn’t play by the rules, or a bridesmaid who loves to shine bright, Poshampa has an array of options in every possible colour and size. 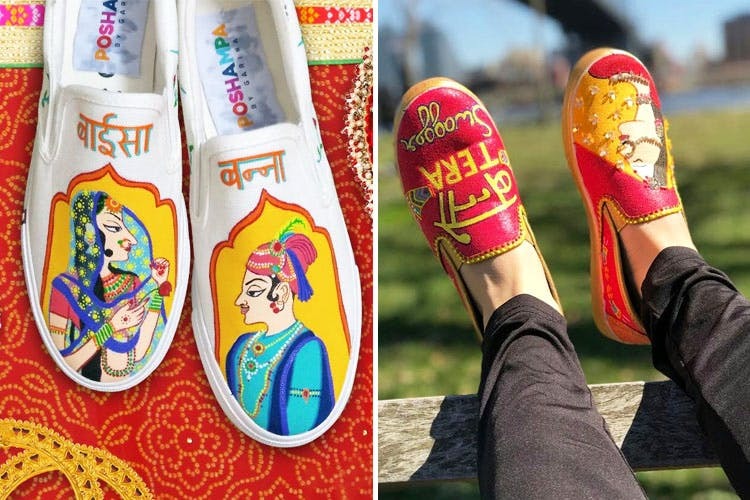 In fact, the creator of these handpainted jootas, Garima, tells us that she can make customised pairs to our exact size and design preferences. This obviously means that we’re going to try and get a border from our lehenga replicated, and will find golden baubles that we like (or brocade laces to match with the blouse? Who knows?). If you aren’t one for made-to-order, the brand’s extensive collection won’t make you miss anything. Their sneakers, for instance, are totally something we’re getting when our bestie’s getting married. To make sure we’re also doing all the running around without painful shoe-bites, we will probably invest in their floral sneakers that can give our trusted mojaris a run for its money. Browse through Poshampa’s Instagram and you’ll really be spoiled for choice between their unicorn-themed sneakers and the indie print ones. Also, shaadis are just an excuse to splurge on these pairs. They actually go perfectly well with pants, dresses and other everyday outfits too. We wish they also had a physical store in the city (because checking how the shoes look on your feet is always a bonus). Wash your shoes by hand with a mild detergent and let them air-dry. Do not put them in the machine as it might damage the artwork.